I am ill-ish. Stayed in bed until noon and now feel dazed and hallucinatory. BUT! I am going to be moderating a panel at the BackSpace Writers Conference this Saturday on book reviewing at ten, and on another panel about writing from your life at 9, so if anyone comes, please say hi. I will be the pale one all in black and I promise whatever I have is not catching! Also, a shout-out! 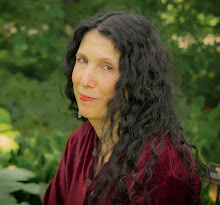 I will be teaching an advanced novel writing course through UCLA's Writers Program! (the link is on the left of the blog.) They are having a Cyber Open House and you can even live chat with me on Tuesday at 9 Eastern time. It's free, but you have to register . I am ending my three weeks teaching writing to the Afghan women, which has been an incredible experience. I cannot thank these brave women enough--or novelist Masha Hamilton who spearheaded this project. A month or so ago, I really needed to talk to a friendly neurologist (for a novel, not because of personal illness!) I asked around and a friend on Facebook assured me that there was no one cooler or more interesting than her buddy, Joe Clark. She was right! Joe not only cheerfully answered all of my questions in great depth, he gave me fascinating information about all sorts of neurological issues, and I could have listened to him for hours. I was in writer heaven and I am truly in his debt! 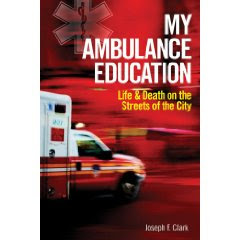 When I found out that he wrote a book, My Ambulance Education: Life & Death on the Streets of the City about his experiences working on an ambulance, I immediately wanted to read it. Great book! Great person! So, of course, I peppered him with questions which he kindly answered. What made you decide to work on an ambulance? Several things pushed me in the direction of writing the book. First as I am still working in the medical field I socialize with people who work in hospitals and emergency rooms. So we often would swap stories and I would engage in telling about my time on the ambulance. Several of my colleagues kept saying that I should write my experiences down and I did. I found that writing them was cathartic, so I just kept it up. My research is concerning stroke and neurologic diseases and I found that my previous ambulance life was benefiting my current work. With my research beginning to be applicable to emergency patients I found myself coming full circle professionally; first working on the ambulance and now doing research to help patients in life and death settings. All these things came together to motivate me to write the book. You're now a scientist and a researcher. In looking back at your experience, was there anything you regret? The answer to that question is an emphatic no. I do not regret the experience I had on the ambulance. I did burn out and that is unfortunate but I grew because of it. In some ways, I am not the person I was in the book especially concerning the burn out. I do think I am a better person and scientist because of those experiences and appreciate the education I received on the ambulance. This is a big part of the reason why “education” is in the title of, my book, which is because that time guided me to my current career and still impacts on what I do. What I loved most about the book was how unsparing you were in your descriptions of what could go right--and what could go wrong. What frightened me in your book was when you talked about the people who were not that talented as far as ER work. I worry about having to go in an ambulance (or have a loved one in one)--are there any ways to tell if the ER workers know what they are doing? In corporate America there is a saying that 20% of the staff do 80% of the work. In an ambulance that is not the case and it cannot be because it is often just two people taking care of the patient. So the people on those teams need to work well together. Fortunately with two people on any given call one of them can often be the lead and do that proficiently. In the Emergency Room of a teaching hospital you want to avoid being sick or injured when the new crop of residents arrive. These are all the “newbies” who haven’t honed their skills so try to avoid the ER in June and July. Usually these people are closely monitored by the senior people. Newbies need to be trained and mentors know to take care of the patient and still educate the new residents. You left because you felt burned out. Is this a common problem and what does the industry do to help people with it? Yes I felt burned out. It is a common problem in this industry and others. Burning out in this case may or may not be related to Post Traumatic Stress Disorder, but fortunately there are programs and research ongoing concerning PTSD. Counseling and institutional support is much better than it was 20 years ago. One of the biggest changes, in my opinion, is that the stigma of PTSD or burning out or failure to cope (choose a name), is abating. Now that PTSD is acknowledged and accepted as being common and/or real, positive steps are being made. When did you know you wanted to write about all of this, and are you writing anything else these days? A date is kind of hard to give, but I think I can give an answer nonetheless. As I said above I started writing down various stories as anecdotes or even homilies that I told to friends as kind of dinner conversation. I wrote seven of these and put them in chronological order and liked what I saw. There was personal growth and informative content. I gave these assembled dinner conversation pieces to some close friends and received positive reinforcement. One physician friend commented that the readings allowed her to understand how and why I was so oriented with my research towards “helping people.” Helping people was a theme in the assembled chapters and these chapters eventually were joined by others to form, My Ambulance Education. As far as writing anything else these days, yes. There are two parts to that answer though. I am constantly writing grants and research papers and that continues as a kind of slow burn in my career. Part two of that answer is that I have a second book that continues where My Ambulance Education leaves off. The working title is, How I Survived My Graduate Education, and is about choosing and obtaining a Ph.D. in the sciences at Michigan State. So a kind of “education” series is being built. I’m currently trying to find a publisher so we shall see how this goes. I also blog concerning my work and writings and this is found at www.josephfclark.com/blog. The blog is a mixture of ambulance, science, research that is relevant to what I am doing personally and professionally. I find your life--and your work--fascinating. Can you talk a bit about it here? Thank you so much for the comment and question. I truly love what I do. I’m a college professor doing research and teaching. Much of my teaching is mentoring graduate students and my research is concerning the causes, diagnosis and treatment of stroke and neurologic disorders. We have discovered a molecule that was completely unknown that is in the spinal fluid of patients with some kinds of stroke, hemorrhagic stroke specifically. It is so cool to discover something that has never been seen, published or patented before and to realize that it may be important in treating people. It will take years for our current research to be used in hospitals, but I do believe that today’s research will be tomorrow’s cutting edge treatment. I’m privileged to be part of this work and leading a great team of people trying to “help people” and save lives. My time on the ambulance started me off trying to help one person at a time and now my research is still trying to “help people” but now with the possibility to help thousands of patients suffering from stroke. I really love my life and enjoy what I do. My hope is that the work that I do in my lifetime will benefit humanity long after I am gone. There is something so wonderful about writing the first draft part of a new novel. It's like the honeymoon phase of a relationship. So far, all the characters are intensely interesting to me, the setting is breathing, and I feel so completely happy you could tie me up with the ribbon and give me away for Christmas. 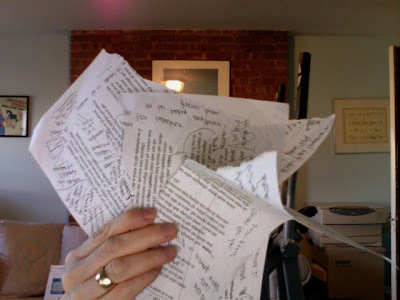 I had to stop to do my copyedits for Breathe, which were hard not just because I had to really focus and make sure everything was the way I wanted, but because I had to re-enter that story-world--and that is like seeing an old lover again and still feeling in love but also knowing that truly, you have to move on. Writers are very lucky people, I think. I wanted to be a writer since I was in first grade, and I remember when I sold my first short story, to the Michigan Quarterly Review, I got myself a T-shirt that said WRITER on it, cut out the neck (that's what you do in ballet class) and wore it to the studio all that year. I was so proud and excited! (No one really cared. They all wanted to be dancers.) But I cared, and every pirouette I made (I admit I could do four! Count them! Four!) I felt more like a writer than a dancer, and I swear that made me spin. Now, I can't do more than one sloppy pirouette and my toe shoes are a thing of the past. But put me in front of a computer or a piece of paper, and I feel as if I'm home. 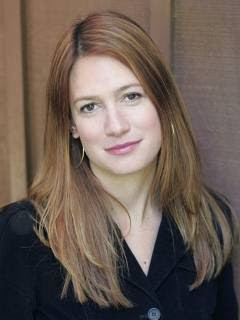 Gillian Flynn wrote one of my favorite novels, Sharp Objects, which won a slew of awards, sold in 22 countries and is optioned by Pathe Films (Slumdog Millionaire). 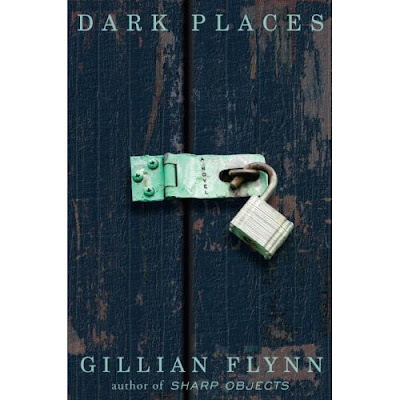 Second novels are always proving grounds, but Flynn's second, Dark Places, is even better than her fantastic first. About a childhood murder, a clandestine society obsessed with notorious crimes, and the secrets we hide from ourselves, Dark Places is unsettling and brilliant. Of course I had to pepper Gillian with questions, and she was gracious enough to respond. Did you always write? And was it always dark? What I love about your work is that there is a kind of glee in the wickedness that reminds me of certain fairy tales (we all love the part of the story when the witch thrusts the kids into her oven, right?) You have said in interviews that you're from a happy family, so where does that dark, slicing edge come from? I always wrote. My first short story was inspired by my third-grade obsession with the Little House on the Prairie series. It was called, quite romantically, "To the Outhouse" and it was about a pioneer girl trying to make it to the potty before a pack of wolves got her. I think the wolves got her, if I remember correctly. And ah, yes, fairy tales! From the time I could read, I loved Brothers Grimm--the dark, unedited meaty Brothers Grimm. Maybe because I was from a fairly normal, cheery family I craved contrast. I was always most interested in the villains of those stories. Why root for the pretty, loving princess--she has enough people on her side! It's the evil crone I wanted to know more about. What makes a woman want to bake kids into pies? Or turn young maidens into songbirds? Why is she all alone? Was she born evil, or did she have some heartbreak? Why? Why? Why? I guess I was born with an affinity for villains. When I was a child, I never wanted to play the princess. I wanted to play the witch. What was your research process like for Dark Places? Do you have trouble with people assuming you are your characters? People definitely assume I'm like my characters--I think they're both relieved and disappointed when they meet me and I don't attack them with a switchblade or guzzle all their liquor (though I wouldn't turn down a nice bourbon if offered.) My research for Dark Places was mostly mental: I put myself in the mind of Libby--a woman who survived the slaughter of her family and became famous for it as a child. I put myself in the mind of Ben--a fatherless 15-year-old kid who wants to be a man, but settles for the aggression he assumes is manly. 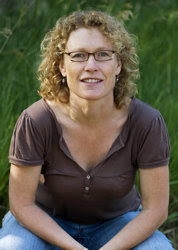 And I put myself in the mind of Patty--a mother of four struggling with a failing farm and an equally faltering family. I wandered around the house, talking to myself in each of their voices, playing music I thought each would listen to, even putting on grungy jeans and a ball cap when I was trying to get into Ben. It's all quite strange and creepy, but it works for me. You're a TV critic for Entertainment Weekly. Does watching so much TV (good and bad) impact your novel writing at all? Structurally and subject-wise? I'm not with EW any more. I'm writing my third book and working on the screenplay for the film adaptation for Sharp Objects, which is quite a scary and cool new challenge. But all that TV? It definitely helped. It helped to spend years thinking, Why is this show good, why is this just OK, why is this bad, and to pinpoint, for me, what worked and didn't. It makes me a bit tougher and more exacting with my own stuff. As I write, my own little critic sits on my shoulder and says, "Wow, that scene was really awful. Flynn-critic, you would give that scene a D!" And I grudgingly rewrite. Dark Places revolves around a terrible series of murders and a little girl who testifies that her brother was the killer. She's later contacted by a secret society obsessed with notorious crimes. So, I have to ask. Are there societies like that? Did you speak with any? I have no idea if there are. I know there are true-crime obsessives and I will admit to being one of them (I can talk Fatal Vision with you all day long.) The idea for the Kill Club came from the fact that large groups of people, largely through the Internet, can now play detective in famous murder cases, and form a real social community around these gruesome events. I took it one step further. What would it look like if they all got together at an actual convention? The idea of role players of famous murders comes from my own nerdy fondness of sci-fi conventions and RenFests. I love fests and cons! Structurally, Dark Place is brilliantly done, which makes me want to ask you about your process. I go where the computer takes me. So far, I haven't know the endings to either of my mysteries. The person I think will be the murderer turns out to be a bit player, a bit player becomes more and more interesting to me and becomes the murderer. With Dark Places, it was Libby who surprised me most of all. I started out writing her as a peppy, proactive church-going sweetie-pie and it obviously didn't work in the least. I was writing the character I thought I wanted to write, not the character I should be writing (who comes out of the triple murder of her family and is peppy?) So I literally trashed about half the book and started from scratch and wrote Libby how she needed (wanted) to be written. I'm in the copyediting stage of Breathe. (The photo doesn't really look like the copyedited pages, but I like it.) This is where everything is questioned, from word choice to logistics to the timeline. My job is to go through the copyeditor's changes and either accept or reject them, to answer her queries, and to make sure everything is as perfect as I can get it. Usually my novels are a mess--I have people driving north on a southern freeway, I have characters age in a nanosecond rather than years, and I might have a dog chomping chocolate with no ill effects. I've had copyeditors for other books who made me crazy because they changed word choices I loved or they questioned things that I wanted stet. But this time, because my editor is so spectacular and thorough and because she went over and over everything, the ms. is relatively clean. And my copyeditor is FAB. She (or he) is catching everything that I would want to be catched! (I'll just use she because it's too cumbersome to keep saying he or she) She questioned how a body gets from a hospital to a funeral home hours away (I didn't know), whether or not a puzzle could feel and look like an asthma inhaler. She's like a literary personal trainer in a way! I cannot express how happy this makes me. OK, a segue. I admit I have been thinking a lot about fear. The other day I was carrying on to a friend, another writer, about how worried I was about my publishing future. I'm scared that the market place is so terrible that my sales will be less than for my last book, which will impact sale of my next novel. I'm scared that because so many newspapers have closed, I won't get reviews. I'm scared! My friend listened and then sighed. "Don't you think what you might be scared of is success?" she asked. "And what that means?" I don't want to go into my psychology here, but I think she's right. Being successful at something comes with a price tag for me, so it's easy and even comfortable to stay lost in the worry world. I never quite believe my success because it feels dangerous to do so. But then I think of another writer friend, who was struggling for so long, and she began monitoring herself every time she started to worry. Instead, she began thinking what it would be like to get a film deal for her book, to get starred reviews everywhere, and guess what, she got it all. I know, I know, (roll of the eyes) magic thinking. But maybe attitude opens you up to new experiences and possibilities. Maybe it's like taking blinders off and seeing what is really there for you if you risk reaching out and grabbing it. In the meantime, I'm going back to my copyedits. I'm going to tell myself, look, you have this book in your hands and it is living and breathing and alive. 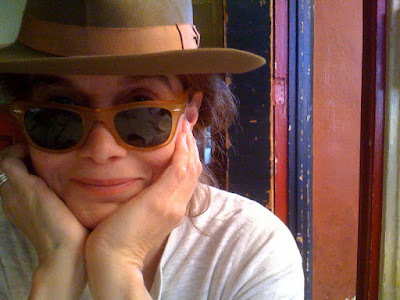 Like millions of people, I happen to adore Melanie Mayron. I remember sitting in a movie theater with my best friend at the time, celebrating our bond by watching Melanie in this wonderful, achingly smart indie film, Girlfriends, and of course, she was the photographer on thirtysomething--the gorgeous girl with one earring who pined for her best friend. Melanie's also directed episodes of Tell Me You Love Me and In Treatment. I recently discovered that Melanie has ventured into the baby product business and she graciously offered to talk about it on my blog. How does an actress/director/writer get into the world of baby products? About 13 years ago I was trying to have a baby. It took me two and a half years before I was able to get pregnant. During that time I got the idea to do a line of baby product with my dad. My sister had developed a hand sanitizer with my dad, (with essential oils as well as alcohol so it was a natural substitute for Purell), called Jao (online at jaoltd.com) and I was jealous of her working with Dad and wanted to be able to as well, and since babies were front and center in my life at that time I thought of baby products. Did you know anything previously about marketing? No, I knew nothing about marketing and still have a way to go. A HUGE way to go. I was able to get a lot of directing work on television the last two years, 3 episodes of “Tell Me You Love Me” and 7 episodes of “In Treatment” on HBO and that gave me a bit extra money that I could finally manufacture the diaper cream and get my business off the ground. (And what did you use on your own kids?) What I used on my own kids was versions of the products I am going to be manufacturing. I used my dad’s numerous versions of diaper cream, and our head to toe shampoo and our lotion and baby oil. Is this something you ever thought you could or would do? I never saw myself working with my Dad when I was younger, but at this point in my life now, it is very exciting. To meet new people and make new friends, and learn a new business… and when you believe in what you have to offer, it really can be terrifically rewarding. Well, most of the diaper creams have paraben, and it is hard to make a good formula with out it. Dad did it and “Our Best” Barrier and Diaper Cream is fantastic if I may say so. In our other products that will be coming out next month, there is no sodium lauryl sulfate and no DEA, and we are really refining the formulas to offer organic essential oils and as many naturally derived ingredients as possible. What's it like working with your father? Terrific. He just turned 82 and is truly phenomenal knowing what ingredients to use for our formulas, and what to stay away from. For example vanilla oil is used in many baby products and that has some serious allergic responses in infants… so he is really trying to make our products as potentially problem free as possible. Did you ever work on anything else together? Yes we built a model of the Parthenon when I was in fourth grade. Used paper towel and toilet paper cardboard tubes. And paper mache. It turned out pretty sensational. Who came up with the great name, Good Baby? I did. My mother’s maiden name is Goodman… so I was trying to blend both last names…. I laughed when I read that your products were tested not on animals, but on actress's babies! What's new in the Good Baby line that's waiting for a celebrity baby trial run? Well we have our head-to-toe shampoo, tangerine baby oil, body milk which I have to say is brilliant! Everyone is going to want that lotion, no matter what age, and our chapped cheek and lip protector with natural sunblock. Where can people buy your products and how is the company doing? Right now we are in stores pretty sporadically spread around. I have been relying on friends I meet on Twitter and Facebook to join the Good Baby effort to help get it out in their areas and become reps…The list of retailers in on the website , and of course we are selling on line at www.mayronsgoodbaby.com. Well, in other news, the first season of the DVD thirtysomething is available to pre-order on Amazon right now and it will be in stores everywhere in August 25th. There is a great new blog called Sweet and Sour Mom, which chronicles motherhood's sweetest and/or sourest moments in 200 words or less. It's open to mothers all over the world, and Alexis, who is running the blog hopes to have a variety of voices, geographics, demographics and experiences, so please feel free to submit! I already wrote a piece, which will be up today or soon, about the time we had a minor car accident and Max, then 18 months old, was taken by ambulance to the local NYC ER. The cops did not come in with us at first, and to my horror, they didn't believe it was a car crash, and treated it like potential abuse--and me, like an abuser. I am thrilled to report I am guest blogging at Kepler's, one of the best indie bookstores in the country. You can find me there Monday, Wed. and Friday. Please drop by, leave a comment and buy books from Kepler's!! 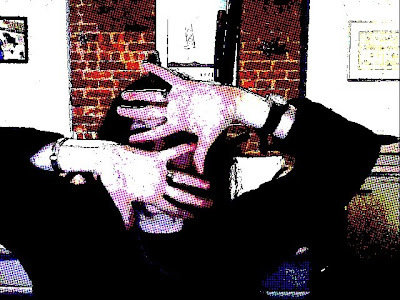 Okay, so I am fooling around with my Mac's photo program again....this one is called Cartoon. a. Blogging for Kepler's! I will post the link. I am really excited about this and I spent a lot of time fooling around on my beloved Mac to get the right photos to go with my three blogs. (Monday, Wednesday and Friday!) I love Kepler's--it is a fabulous indie bookstore and every writer and reader should really support it. b. Teaching Afghan women writing. See post below. I am so excited. I really cannot wait. c. Trying to get to Chapter Four! I married this new novel and am in our honeymoon stage still. Bliss, bliss, bliss. d. Teaching at UCLA and finishing with a private student. And of course, because of the horrible economy, the ubiquitous, soul-killing job of looking for more freelance work. Sigh, can't I just get a movie made instead? These are women who, when permitted to attend school, are often NOT encouraged to seek a higher education. They have such strong voices, (and what a wealth of experiences), and they just need development. Some are young journalists; others have studied briefly in the states but are now back home, others hope to study here at some point. They all have workable English (sometimes excellent English) and access to a computer. She's seeking women writing teachers who might agree to rotating work online for three weeks or so with these young women over the next six to nine months. This is pro bono, but very rewarding. So much is happening in the country. We have no Afghan women writers that I know of, and I think that's a loss... I was in Afghanistan in November and met some of these women, but most I do not know personally. If you might be interested and willing to work online with, say, six young women—giving them exercises, encouragement and critiques—send an email tomasha@mashahamilton.com. What it would involve: connecting with the women by giving them your brief bio. (If they have not already filed bios, you will ask them to do the same.) Then once per week, say every Monday, offering a smorgasbord of exercises, maybe five or six for them to choose from – some less formal freewrites, some more formal exercises they might revise before offering. Then going online once every day or other day to respond to their work. I would ask for a three- or four-week commitment. For scheduling purposes, let me know what weeks or months might work or not work for you. If you would be ready to jump in immediately, let me know. I’m also seeking blog master who would be willing to set up a blog where we could acknowledge those teachers giving up their free time to be involved, linking to their websites or blogs, but where primarily we could get “out there” the works of these young women. The idea is that teachers who feel they have student work ready to share could post it on the blog. I know how busy everyone is; thank you so much for considering giving some time to this woman-to-woman project. P.S. I (Caroline) am going to do this. How could I not? Because I'm a book critic, I get a lot of books. I always read the first paragraph and I can pretty much tell how hooked I am going to be by page 2. 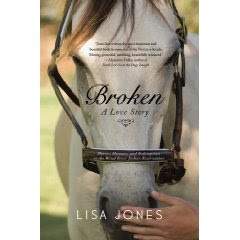 This incredible book, Broken: A Love Story, by the extraordinary Lisa Jones, got me in the first few sentences. 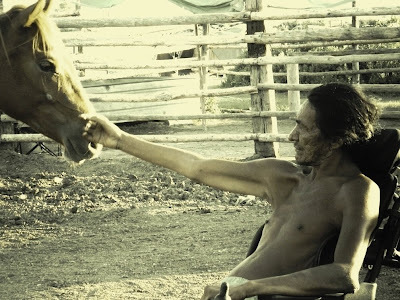 Jones went to Wyoming to meet the remarkable Stanford Addison, a Northern Arapaho who gentled horses and it was said, healed people--all from his wheelchair. Lisa ended up spending four years there, and along with telling Stan's story, she threaded in the story of her relationship and her transformation. I so wanted to talk to Lisa, and she was so generous with her time, and so much fun, that I feel a little dazzled presenting this Q and A. Thank you so much, Lisa, and if you ever come to NYC, City Bakery is on me. What struck me was that while dealing with a man who claimed to hear spirits, and with wild horses and all manner of things, you never seemed scared around him. Were you, and if not, why not? I was scared of him very early in the book, after I felt his unmistakable power over me when I worked the horse in the corral and heard his  neighbors tell stories about his healing powers. I also knew that spiritually powerful people can misuse their power (especially spiritual men over their female followers), so I embarked on my trip to Iowa with Stanford with a lot of trepidation. But we hadn't gone a few miles down the road when it struck me I was perfectly safe and happy around this man. I knew he was good and kind and respectful. And that never changed. Considering the pain I carried around due to a father who wasn't exactly respectful of women, Stan's immaculate treatment of me was like manna from heaven. One of the things (among many) that I loved about the book is that you really give us an insider look at the Indian community, from the sweat lodges to the way Indians are treated in the non-Indian community. Your mother, in one of the funnier passages, tells you to respect your genetic makeup and reminds you that you are not an Indian. How close do you feel to Indian culture now? I don't spend as much time at Stanford's as I used to, although I'm writing you from Wyoming right now -- I've actually been here three or four times since March and it's not even May yet. (Most of these visits revolve around his health, which has hit a rough patch lately.) When I'm here I go to all of Stanford's sweats. Anyway, When I'm home in Colorado, my spiritual practice revolves around taking long walks in nature. On these hikes I pick a lot of sweet sage, which grows prolifically near my home on Colorado's Front Range (and which was the last home the Arapaho picked for themselves.) I send packages of it to Stanford to use in his sweat lodge. And that feels like a lovely connection; a sort of active prayer. At home, I pray, and light sage. That I got straight from Stanford. Tiny vestiges of the sweat lodge. And while I'm totally involved in my life in Colorado, the minute I go to Wyoming, the familiarity and at-homeness surround me really quickly,  the way you can pick up a conversation with a friend that got interrupted months and months ago and it's as if you never stopped talking. Part of the book revolves around your relationship with Peter, who seems so hell-bent on a spiritual quest that I was really surprised—and delighted, at the way that relationship transformed. I’m curious, did this unfold as you were writing the book, or did it all happen before you began to write? At what point did you realize the book was going to be about two journeys—yours and Stan’s? That's a great question. Um. At first it was all going to just be about Stanford. But time -- years, really -- passed, and I found myself in front of the camera. Part of this was due the fact that I couldn't get away with doing the typical white thing -- ask a direct question about his spirituality or his life and get a direct answer. He would just finger his mustache and say,"You're just going to have to hang around some." So I did. And I formed my own relationships and made my own mistakes. There was a long period when I was going to Stan's and writing about it and not really knowing where it was all going in terms of the book, but I was so enchanted by what I was experiencing I didn't really care. People would say, "when will you be done with your research?" and I'd say "Research?" and think, "My God, I have TOTALLY left the known shore." I mean, prior to this book my biggest writing project was a 2 1/2 year investigation into the way colleges of agriculture and forestry in the Rocky Mountain West taught natural resource management! Writing this book wasn't about accumulating knowledge and then writing it down. It was more like going snorkeling and not knowing exactly what I'd find, but knowing I'd know it when I floated over it. And that's exactly what happened. And although I could have written an entire second book on what's happened since I closed the action of BROKEN, there was a clear sense of closure when it was time to stop writing. Stanford became paralyzed after a terrible accident and a wild, carousing youth, but he received a gift—the ability to shrink tumors, gentle horses and help his people. He was transformed. But you, too, were transformed from knowing him—and knowing yourself. Can you talk about that transformation? I wish I could say my time on the Wind River rearranged me into the finished product, a wise woman who remains calm and happy in every situation, who never snipes about people behind their backs or argues with her husband or feels tragically sorry for herself or gets so upset by the actions of a certain president that she stopped reading the newspaper for FOUR YEARS. But that's not what happened. I can still be a complete idiot. Still, I know I'm vastly better off -- less restless, more let-go, happier, happily married to my husband although we certainly have our issues, no longer making an art form out of blaming my parents for the deficiencies in my upbringing -- due to the time and experiences I had at Stan's. I think the proof showed up in the pudding about three years ago, when a very old friend asked me how I was doing and I said, "Lucky." and she said, "I've been waiting for about 15 years for you to say that." At one point in the book, Moses says about the non-Indian world, “It’s the White world, it’s lonely!”  Your book certainly makes me feel that this non-Indian world is filled with less magic and less spirit, which indeed makes it seem lonelier. How do you personally reconcile that since you are now off the reservation? What keeps you centered? And can you still be connected to that deep spirituality and magic or has something else taken its place? When I drive up from Colorado and hit the high desert of Wyoming and see the Wind River Range in the distance, I just about die of happiness. Every time. So I'm not completely integrated or resolved. I still yearn for Wyoming. But I think that's part of life -- there are certain aches in the heart that don't go away. You just make room for them. As for how centered I am, see question #4, and as for what's taken its place, see question #2. I have to ask: while in a sweat lodge, you witnessed a cancer coming out of a woman’s body. How is that woman now? This woman, a good friend of mine who happens to be white, was suffering from a particularly virulent strain of breast cancer that had spread to her bones. She was near the end of the year the white medical doctors had predicted she had left to live and arrived on the reservation gulping Oxycodone (a powerful narcotic pain reliever). After the sweat lodge I refer to in the book, Stanford said we'd gotten the cancer out, but if she continued with chemotherapy, she would die. She felt better than ever after the sweat (sweats, actually -- she, me, and about a dozen friends made two trips to Stanford's in which she did four sweat lodges each and a third trip where we did one sweat before we were stopped by torrential rains), and then went home to Kansas. Cultural conditioning being the unstoppable thing it is, she went back on chemo. Awhile later tumors were found in her brain. She is still on chemotherapy. Her sight is starting to go. But she has lived two years past her predicted survival date and is still dancing at parties and being generally delightful. And she's not on Oxycodone -- she makes do with a couple of Aleves a week. And her doctors think she's a marvel. What happens in Stanford's sweat lodge is unknowable to me, but I do think the attitude of the person there for healing is very important. It's not a magic wand he can wave over just anyone and BAM, heal them. But it's a healing method friends of mine on the reservation take very seriously, and it works for them. I know that for me the sweat lodge is a hugely mentally healing process. You talk about the love that is above romantic love, that is akin to surrender. Do you think there is a way to attain that for those who don’t go to sweat lodges or have the opportunity to meet someone as remarkable as Stan? Weyull, I think there are lots of road to this place. The Christians practice centering prayer, the Buddhists meditate, extreme surfers catch the uncatchable wave, as I wrote above, I have a thing for walking in the woods. I come home really centered and rejuvenated and calm. More than that -- I am closer to the way I felt when I was with Stanford -- as though there is very thin membrane between me and the divine, like I can feel the warmth of it. I think there are many ways to get there. Stan's way (preceded by years of Buddhist practice) just happened to agree with me. I'm writing to you from his bedside at the hospital. He continues to battle bedsores and infections. This Halloween he'll have been a quadriplegic for 30 years. He turned 50 in late April, and on his birthday had to go back to the hospital for the third time in seven weeks. But he always astonishes me with his ability to bounce back. Sometimes it all comes together and writing is just bliss. As anyone who reads this blog knows, I do whine and carry on and get so traumatized by my work that I am about to jump out of my skin. I worry constantly. Will Breathe do well when it comes out? Will it get reviewed? Will it get paperback, foreign sales and oh please Goddess of writing, a film deal? Will I ever be published again or will I end up working as a cashier at Wal-Mart, adding up other peoples' cans of tuna and towels and lurid paperback books sold by the magazine counter? My mind starts to become a neighborhood I don't really want to hang around in too long. That feeling, that commitment, is something writers have to work on, like any relationship, I suppose. You can't take it for granted, you can't forget the sweet talk and passionate kisses or the difficult talks. And you absolutely cannot be afraid. Okay, my blog feels possessed. Who knows how to ensure that the fonts are all the same size and how do you keep them from suddenly swelling into GIANT sizes? How do you make a double spaced entry turn back into single spaced, even when it is cranky and resistant and it refuses to listen to you? And as long as I am asking questions, does anyone know how to make Ethiopian food at home? While grappling with Chapter Three, and trying to seduce Chapter Four into revealing itself, I have been doing a whole lot of reading. Yes, my eyes feel like they are falling out of my head, and I am lost in my own story worlds and the story worlds of others, but it really is sort of divine. As Margaret, a widow, mourns her runaway teenaged daughter, a young mysterious girl named Nora shows up on her doorstep. Taking her in, Margaret tells everyone she is her granddaughter, even when Nora insists she is an angel of destruction. As Nora reveals more and more unsettling powers and truths, Margaret begins to find out what really happened to her daughter, and how Nora is the bridge between all of them. Gorgeous and unsettling, this haunting novel gets at the heart of how—and why—we yearn to connect. Welcome to Rancho Esperanza, where Republicans and their money hold sway. Here, you’ll meet a dying breed of aristocrats who tell their stories over time, from the fabulous 1940s through the richly rewarding Clinton years. Written as a novel in stories, this is social satire that explores everything we ever thought we knew about status and money—and it does it in a sly original way. You couldn’t ask for a wackier coming of age than Collie Flanagan’s. Heir to his father’s publishing fortune, Collie is the square peg in his Irish Catholic family’s roundly eccentric universe. But when a family tragedy derails him, he must battle his way out of the family brawls and ice cream dinners for a chance at redemption. Reminiscent of a wild, wooly over-the-top John Irving novel, this bursting-with-life book just might be a cult classic. 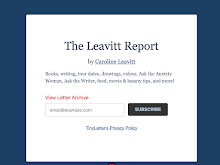 A stellar roster of writers like Ann Hood, Jacquelyn Mitchard, Joyce Maynard and more ruminate on the funny, sad, angry and heartfelt attachments we have with our moms. Grab up a copy now for your maternal figure. Critical car and emergency flight nurse Jennifer Culkin's book is haunting and evocative chronicle of how her personal life collides with her professional one. Grappling with MS, she writes about the fragility of life with true grace.